The first lady was an arrogant California woman married to a wealthy man. The second was a well mannered elderly woman from the South. When the conversation centered on whether they had any children, the California woman started by saying, "When my first child was born, my husband built a beautiful mansion for me." The lady from the South commented, "Well, isn't that precious?" The first woman continued, "When my second child was born, my husband bought me a beautiful Mercedes-Benz.. Again, the lady from the South commented, "Well, isn't that precious?" The first woman continued boasting, "Then, when my third child was born, my husband bought me this exquisite diamond bracelet. Yet again, the Southern lady commented, "Well, isn't that precious?" The first woman then asked her companion, "What did your husband buy for you when you had your first child?" "My husband sent me to Charm School," declared the Southern lady. "Charm School?" the first woman cried, "Oh, my God! What on earth for?" The Southern lady responded, "Well for example, instead of saying "Who gives a CRAP?" I learned to say, "Well, isn't that precious!" This was written by Sherry Hackett, Buddy Hackett's widow. people on the stage, were the only one not honoring our tradition. your flower onto the pile without leaning over. us. In fact, you insulted the British Crown beyond belief. and Pastor Wright because it was politically expedient to do so. people who built her, you wouldn't be sitting in the White House now. available, not a very remarkable one. affection for this country and her traditions. package that, along with cap and trade, will bankrupt this nation. had the right to speak out. Sometimes we wonder, "What did I do to deserve this?" or "Why did God have to do this to me?" A daughter is telling her Mother how everything is going wrong. and her best friend is moving away. and the daughter says, "Absolutely Mom, I love your cake." "Would you like some flour then? Or maybe baking soda?" "Mom, those are all yucky!" "Yes, all those things seem bad all by themselves. they make a wonderfully delicious cake! " go through such bad and difficult times. they will all make something wonderful! He can live anywhere in the universe, and He chose your heart. 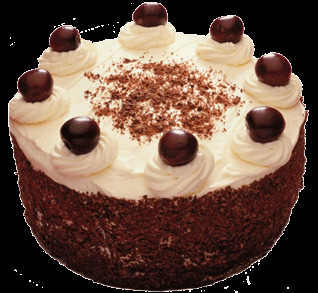 I hope your day is a piece of cake!!!! I'll let you go alone. Or you may not be here. That the blogs will bring. A well-known speaker started off his seminar by holding up a $20.00 bill. In the room of 200, he asked, "Who would like this $20 bill?" Hands started going up. He said, "I am going to give this $20 to one of you but first, let me do this. He proceeded to crumple up the $20 dollar bill. He then asked, "Who still wants it?" Still the hands were up in the air. Well, he replied, "What if I do this?" And he dropped it on the ground and started to grind it into the floor with his shoe. He picked it up, now crumpled and dirty. "Now, who still wants it?" Still the hands went into the air. "My friends, we have all learned a very valuable lesson. No matter what I did to the money, you still wanted it because it did not decrease in value. It was still worth $20. Many times in our lives, we are dropped, crumpled, and ground into the dirt by the decisions we make and the circumstances that come our way. We feel as though we are worthless. But no matter what has happened or what will happen, you will never lose your value. Dirty or clean, crumpled or finely creased, you are still priceless to those who DO LOVE you. The worth of our lives comes not in what we do or who we know, but by WHO WE ARE and WHOSE WE ARE. You are special - Don't EVER forget it." the face that does well to hide. to take that second glance. when twice you look again. be united in thy care. and our quest for outer space. that "The Battle is the Lord's"
and a peace that cannot last. "God, show us where we're wrong"
and that He Is "King of Kings"
are the gods we serve today. we are seeking to destroy. and give us higher goals. all the world needs guided men. When you thought I wasn't looking, I saw you hang my first painting on the refrigerator, and I immediately wanted to paint another one. When you thought I wasn't looking, I saw you make my favorite cake for me, and I learned that the little things can be the special things in life. When you thought I wasn't looking, I saw you take care of our house and everyone in it, and I learned we have to take care of what we are given. When you thought I wasn't looking, I saw how you handled your responsibilities, even when you didn't feel good, and I learned that I would have to be responsible when I grow up. life's lessons that I need to know to be a good and productive person when I grow up. Yeah...ok...so I haven't posted anything on here in about 5 days. I had somewhat of a brain freeze and got sidetracked by the everyday hustle and stress of what we like to call "life". It happens to the best of us right? I sat here for about an hour trying to figure out what my next post would be, trying to get my creative juices flowing. How frustrating it is when you can't think of anything to write. My husband told me "Honey you can be creative and write about anything, your job (yuck), the dogs, your kids, a blog post you saw, a picture, etc." Nothing, absolutely nothing, was igniting my creativity until I went to his blog and watched, for the 10th time, a video of Billy Gilman and this precious, beautiful little girl named Abbey Umali singing What A Wonderful World. This little angel is the Goodwill Ambassador for MDA. Abbey sang that song from the heart and so did Billy. She brought him to tears. It sure humbles me. That amazing little girl has MD and may not live as long as I have but here she sat with that beautiful smile, singing the one song that should make us thankful for everything...even the little things we sometimes overlook. Which got me to thinking...sometimes I let life get me down and I sweat the small stuff. You know the stress I'm talking about, we all deal with it...an unrewarding job or one you hate, not enough money, bosses you want to kick in the knee (lol), rude customers, I could go on and on but you get my point. Then I get home, finally, so relieved, and my husband is happy to see me, tells me he missed me and he loves me, our puppy is ecstatic to see me and won't stop kissing me and trying to eat my face. Then after dinner I come on here and start searching for blogs I've yet to discover. Whew, I'm relaxed and breathing again. Then after a few hours I decide to check out that video on my husband's blog again and see beautiful little Abbey with a smile that could melt even the hardest of hearts and I am humbled all over again. So it got me to thinking that this would be the ideal subject for me to talk about. I decided not to post that video on my blog because my husband already has it posted so I went to Youtube and found a live video that is beautiful too. I sat and watched that and realized everything I have to be thankful for...another day that God has given me breath, my health, my husband and best friend, my wonderful children and grandchildren, my family, the fact that even though I don't always like my job I need to be thankful for it because there are others who haven't worked in months, my puppies who love me no matter what I say or do. We need to be thankful each and every day for everything we have. I can tell you from experience that we could be far worse off because there is always someone somewhere suffering more than we are. I could sit here all night and think of all the things I should be thanking God for. But in the end I'll just say thank you, thank you, thank you Lord, for everything...What A Wonderful World you created for us. This post is dedicated to a wonderful and amazing woman with the voice of an angel. She had such a gentle and loving spirit and was loved by many. Her legacy lives on through her music and her voice had and still to this day has the ability to draw you in and capture you heart and soul. She brought beauty to the eyes and ears of anyone she ever encountered. She mesmerized, hypnotized, and painted wonderful and vivid pictures for each listener. Sadly, she would not be properly recognized or honored until after her death. There will never be another like her in our lifetime. I know she is singing with the angels. I am forever changed by this beautiful woman and miss her tremendously. She has always had the ability to bring out such emotion in me and bring me to tears! Here are some of my favorite performances by this lovely woman. I know you'll love them as I do! and thanks the Lord for everything. from those he loves, he still smiles today. for joy he's found throughout the years. he whispers such love to me, his wife. when he held the hands of his little boys & girl. he still says they can do anything. and wonders why so many lose. his heart still cares for all the rest. his vanity stored on a shelf. his heart is unaltered by Greater love. with a broken life, and what he's become. the blessings born of his woman's love. he's the greatest man I have ever known. Whoever said that life is a bed of roses probably didn't warn you about the thorns. Just as we look past the thorns to see the beauty of the voluptuous rose, so must we do in life. There are a thousand examples of looking past the pain in order to behold something beautiful, too many to mention! How many times do we endure to reap the rewards? How many times have we given up, only to miss the blessings? I think of the woman, mentioned in the Bible, with the issue of blood. The pain she must have felt, the discouragement and heartache she knew so well. When all odds were against her, she kept pressing on. She knew that Jesus was passing by and she longed to touch the hem of His garment. Her determination to push through the crowd was enough. Her faith was everything. She pressed on until she touched His garment and right then, it happened, her miracle was fulfilled. 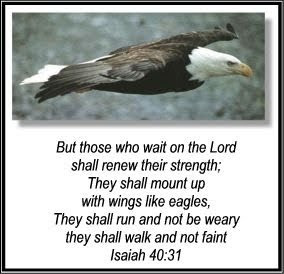 Today we need to pray for that same zeal and determination to press on. It seems as though life throws us so many challenges. Every single day you will hear of someone, somewhere going through something. Or what about in your own life? Are you faced with circumstances that get you down? It may not be a physical challenge, it may be challenges in the home, on the job, within family and friends or a struggle for inner motivation. Whatever it may be, know that you can find your inner strength to press through the crowds that slow you down. There are too many biblical examples of children of God pressing through to use all at once. They all have their own story, each one unique. Still, the end results are all the same; They endured until they knew the taste of victory. Healing, triumphs, countless miracles; all came about through faith and perseverance. If they had given up, there would have been no rewards. It seems that anything out of the ordinary taps into the doubting Thomas within us, causing us to ask, "Why?" Face it, most of us are analytical people. We want to understand everything. If the answer can't come through reasoning then it's not acceptable in the sight of many. Rather than trusting through faith many of us would rather ignore these things we can't comprehend. It's easier to pass something by than to look beyond what's clearly on the surface. Being in ministry, I am faced with the thoughts of, "Why?" quite often. There are many times I want the cold hard facts that can explain why. I want the now yesterday and the tomorrows now! Through God's grace, I am learning to lean not on my own understanding. I am gaining wisdom and learning to see the beauty of God's plan. I can see that His ways are better than my ways. When I am bound by the challenges of life, I look through the crowds. If I can just touch the hem of His garment I will know that times of enduring were worth not understanding. My absolute favorite song by my hero!!! God bless you Jerry we love you!!! Some years ago on a hot summer day in South Florida, a little boy decided to go for a swim in the old swimming hole behind his house. In a hurry to dive into the cool water, he ran out the back door, leaving behind shoes, socks and shirt as he went. He flew into the water, not realizing that as he swam toward the middle of the lake, an alligator was swimming toward the shore. His father, working in the yard, saw the two as they got closer and closer together. In utter fear, he ran toward the water, yelling to his son as loudly as he could. Hearing his voice, the little boy became alarmed and made a U-turn to swim to his father. It was too late. Just as he reached his father, the alligator reached him. From the dock, the father grabbed his little boy by the arms just as the alligator snatched his legs. That began an incredible tug-of-war between the two. The alligator was much stronger than the father, but the father was much too passionate to let go. A farmer happened to drive by, heard his screams, raced from his truck, took aim and shot the alligator. The Scripture teaches that God loves you. You are a child of God . He wants to protect you and provide for you in every way. But sometimes we foolishly wade into dangerous situations, not knowing what lies ahead. The swimming hole of life is filled with peril and we forget that the enemy is waiting to attack. That's when the tug-of-war begins - and if you have the scars of His love on your arms, be very, very grateful. He did not, and will not ever let you go. Please pass this on to those you love. God has blessed you, so that you can be a blessing to others. You just never know where a person is in their Life, and what they are going through. Never judge another person's scars, because you don't know how they got them. Also, it is so important that we are not selfish, to receive the blessings of these messages, without forwarding them to someone else. Right now, someone needs to know that God loves them, and you love them, too, enough to not let them go. How Much You Love Them!!! There was this little girl sitting by herself in the park. Everyone passed by her and never stopped to see why she looked so sad. Dressed in a worn pink dress, barefoot and dirty, the girl just sat and watched the people go by. She never tried to speak. She never said a word. Many people passed by her, but no one would stop. The next day I decided to go back to the park in curiosity to see if the little girl would still be there. Yes, she was there, right in the very spot where she was yesterday, and still with the same sad look in her eyes. Today I was to make my own move and walk over to the little girl, for as we all know, a park full of strange people is not a place for young children to play alone. As I got closer I could see the back of the little girl's dress. It was grotesquely shaped. I figured that was the reason people just passed by and made no effort to speak to her. Deformities are a low blow to our society and, heaven forbid if you make a step toward assisting someone who is different. As I got closer, the little girl lowered her eyes slightly to avoid my intent stare. As I approached her, I could see the shape of her back more clearly. She was grotesquely shaped in a humped over form. I smiled to let her know it was okay, I was there to help, to talk. I sat down beside her and opened with a simple, “Hello.” The little girl acted shocked, and stammered “Hi” after a long stare into my eyes. I smiled and she shyly smiled back. We talked until darkness fell and the park was completely empty. I asked the girl why she was so sad. The little girl looked at me with a sad face said, “Because I'm Different.” I immediately said, “That you are!” and smiled. The little girl acted even sadder and said “I know.” “Little girl,” I said “you remind me of an angel, sweet and innocent.” She looked at me and smiled then slowly she got to her feet and said “Really?” “Yes, you're like a little Guardian Angel sent to watch over all the people walking by.” She nodded her head yes, and smiled. With that she opened the back of her pink dress and allowed her wings to spread then she said “I am. I'm your guardian angel”, with a twinkle in her eye. I was speechless, sure I was seeing things. She said “For once you thought of someone other than yourself. My job here is done.” I got to my feet and said, “Wait, why did no one stop to help an Angel?” She looked at me, smiled, and said, “You're the only one that could see me,” and then she was gone. And with that, my life was changed dramatically. So when you think you're all you have remember, your angel is always watching over you. Share this with everyone that means anything at all to you. 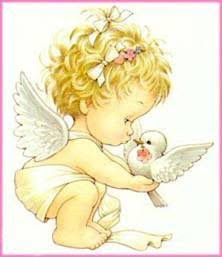 Like the story says, we all need someone....and every one of your friends is an angel in their own way. 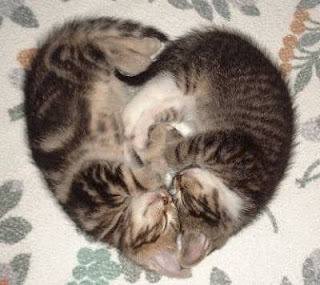 The value of a friend is measured in the heart. I hope your Guardian Angel watches over you always. 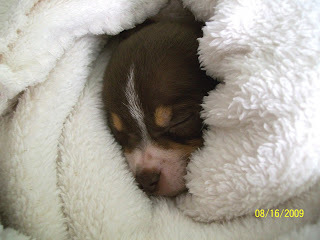 On Friday we picked up our new puppy and decided to name him Mocha Kiss. 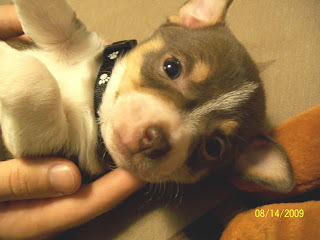 He is a male chihuahua and weighs about 1/2 pound. (A monster huh?) He has such a comical personality and he's so laid back as you can see in this picture. He's already stolen our hearts and taken over our household. Alot of people name their chihuahuas Paco, Taco, Pancho etc. but we wanted to name him something that didn't refer to his breed. His name was Tonka until we had him home for a few days and decided with his chocolate color and the fact that he is a licking machine that Mocha Kiss suited him better don't you think? This is Mocha after his bath. Poor little thing was freezing and kept trying to drink his bath water. I guess his bath tired him out! 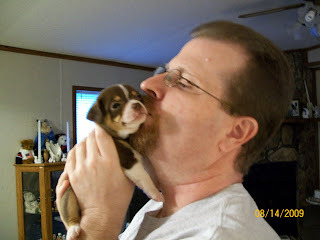 This is Daddy kissing Mocha. Isn't that sweet? I love this picture!